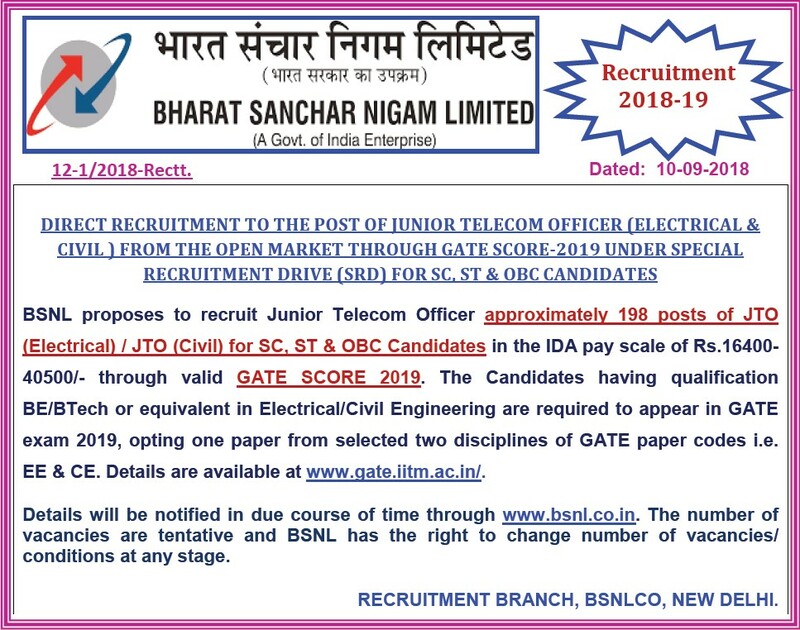 --Recruitment of "Graduate Engineer to the post of Junior Telecom Officer(Civil & Electrical)(JTO(C) JTO(E))" in BSNL from open market through valid GATE Score-2019 under Special Recruitment Drive(SRD) for SC,ST & OBC Candidates. --PROTECT YOUR CHILDREN FROM ONLINE THREAT USING PARENTAL CONTROL. -- 2ND MERIT LIST OF QUALIFIED CANDIDATES FOR THE RECRUITMENT OF JUNIOR ACCONTS OFFICERs (JAO) IN BSNL FROM OPEN MARKET, NOTIFIED VIDE No. 10-1/ 2017-Rectt. DATED 04.09.2017, THROUGH COMPETITIVE EXAMINATION, HELD ON 5TH & 6TH NOV-2017. Leverage technology to provide affordable and innovative telecom Services/products across customer segments. Providing reliable telecom services that are value for money. Generating value for all stakeholders – employees, shareholders, vendors & business associates. Excellence in customer service -friendly, reliable, time bound, convenient and courteous service. Offering differentiated products/services tailored to different service segments. Developing a marketing and sales culture that is responsive to customer needs. To explore International markets for Global presence. Maximizing return on existing assets with sustained focus on profitability. Bharat Sanchar Nigam Ltd. was formed on 1st October, 2000. It is having Pan India presence except Delhi and Mumbai and is an integrated telecommunications company. It has installed large Quality Telecom Network in the country. The Company is working on expanding and upgrading the network to provide service in new areas and to introduce new telecom services. The company has experienced manpower with vast experience in planning, installation, commissioning and maintenance of Mobile Switching & Transmission Networks. It has an in-house world class ISO 9000 certified Telecom Training Institutes. BSNL serves its customers as a one stop solution to all telecommunication needs with the largest bouquet of telecom services. The company offers wide ranging and most transparent tariff schemes designed to suite every customer. Click here for details of the services being offered for the entire India barring the cities of Delhi and Mumbai. BSNL is committed to provide state of the art uninterrupted telecom services to its customers and comply with the quality benchmarks as prescribed by TRAI or set forth by itself from time to time. Quality of service benchmarks as admissible to consumers for Basic services (wire line). (iv) Closures Within 7 days. (vi) Time taken for refund of deposits after closure Within sixty days after closure. (B) The bench marks as admissible to consumers for broadband service is as below. /Activation Time All cases within fifteen days (subject to technical feasibility). (iii) Billing Performance (a) Percentage of Billing Complaints resolved. (b) Time taken for refund of deposits after closure (a) All billing complaints to be resolved within four weeks. (b) All cases of refund of deposits to be made within sixty days after closure. (C) Quality of service benchmarks as admissible to consumers for mobile services. D & E. Capability Developed and Being Performed to Meet the Benchmarks. BSNL has put in place Centralized Billing & Customer Care System with automated Fault Repair System. S.No. Type of Service Toll Free No. (c) In addition, Customers can also book complaints through BSNL’s “Public Grievances Redressal management System” (PGRMS) and through CPGRAMS (Central Govt. PG portal). (3) E-mails: Complaints can also be booked through e-mail addresses which are available in BSNL Corporate Office and Circle websites. (4) Facebook/Twitter Complaints can also be lodged from BSNL Facebook page BSNL India, www.facebook.com/CMDBSNL, Twitter accounts Twitter/BSNLCO and www.twitter.com/CMDBSNL. (6) Walk-in: BSNL has vast network Customer Care Centres. Besides these local officers are available to listen to complainants in person. (7) Mobile Application: Customers can also access BSNL services through “My BSNL” Mobile Application for Android and Windows smartphone. It allows the subscribers to pay bills, recharge and manage their Mobile, Land-line and Broadband services from mobile and tablets. 1)	Every complaint at Complaint Centre (Call Centre) is registered by giving Unique Docket Number, which will remain in the system for at least three months. update the system with details of action taken. The sub-menu in the third level also contains option enabling the consumer to speak to a consumer care agent. In addition to the above, subscribers whose grievances remained unsettled are invited to make petitions for redressal of their grievances in Telephone Adalats. SSA(Secondary Switching Area) Level Telephone Adalats are being conducted on bimonthly periodicity and Circle level Telephone Adalats are being conducted once in three months. Customers are asked to give their grievances in writing with all supporting documents within stipulated period to District Complaint Officer (DCO). The concerned office to whom the case relates examines the case received by DCO and settles the case. A speaking order settling the case is communicated to the customers. For unsettled cases, a date is fixed for holding the Telephone Adalat. The customers are invited to attend the Telephone Adalat. The Adalat is presided over by General Manager of the area. The concerned officers of the Department are also called to be present in the Adalat. The full details of the case is presented to the presiding officer. The order of the presiding officer is communicated in the Adalat after hearing the arguments from both the parties. BSNL conducts Consumer Education workshops periodically to enlighten and bring the awareness among the consumers, wherein the members registered with Authority (TRAI), along with the officers from BSNL attends and probable solutions are given for the queries raised by Consumers. F. Contact Detail of Appellate Authority. If the consumer is not satisfied with the redressal of his complaint by the Complaint Centre or, if his complaint remains unaddressed or no intimation of redressal of his complaint is received within the period specified, such consumer may prefer an appeal to the Appellate Authority through e-mail or FAX or post or in person within a period of 30 days after expiry of time limit specified for redressal of grievance. Appellate Authority will entertain an appeal even after expiry of said period of 30 days but before three months after expiry of time limit specified for redressal of grievance. Two member Advisory Committee comprised of one member from Consumer Organization registered with the Authority and other member from BSNL has been set up in each Service Area separately to offer an advice on all such appeals preferred to the Appellate Authority. Name and designation of the Appellate Authority of respective Service Area along with his contact telephone number, FAX number, e-mail id and office addresses is displayed in his office, Complaint Centre (Call Centre) and Customer Service Centre (CSC) and can also be seen on BSNL website. Step-1. Please Choose your Circle: by click on blank box. Step-2. Click on submit box to find out the PG Appellate Authority. In addition to the above, changes in Appellate Authority is also published in two leading newspapers, one in Hindi or English and other in the local language of service area within 7 days of appointment of Appellate Authority beside update the BSNL website. BSNL has established “Web based Grievance Monitoring System” to enable the consumers to monitor the status of their complaints in their respective Service Areas. Details about address & process for booking and monitoring the complaints on “Web Based Monitoring System” . Any change in the address, of the “Web Based Complaint Monitoring System” shall also be intimated to the consumers in the same manner as (a) above. Consumers can give their feedback and suggestions for further improvement in the services to GM (CDN) on his email id ddgpg@bsnl.co.in. BSNL strives to evaluate feedback received from the consumers either in form of grievances or suggestions and makes necessary improvement in the system to maintain the standards of the services. TRAI also issues guidelines to improve the system. Valuable suggestions given by the consumers are duly considered while reviewing “Citizen Charter” of the BSNL. Right to be informed about charges, validity period and the procedure to unsubscribe before activation of any value added service, which is chargeable. Right for stoppage of all commercial calls/SMS fully or partially. Right of consumers for termination or disconnection of service: The consumer can get the service offered by BSNL terminated or disconnected any point of time by applying to the local BSNL office. The consumer is, however obliged to make payment of all the bills in respect of services availed by him. 2.	before or after filing of complaint or appeal, under these regulations, exercise his right conferred upon him under the Consumer Protection Act, 1986(68 of 1986) or any other law for the time being in force and seek redressal of his grievance under that Act or law. Any person, including foreign national with valid passport, who is major(In case of minor, through guardian) can apply for a telecom service. The provision of service is subject to the directions issued by government from time to time.. The fixed services are meant for specified location and the subscriber is not authorized to shift the same without permission of BSNL. The services are offered subject to regular payment of bills by the subscriber failing which BSNL may suspend temporarily or disconnect or withdraw the service at its sole discretion.. While BSNL shall endeavor to ensure un-interrupted service of reasonable quality, it cannot be held responsible for any deficiency or interruption in service due to reasons beyond its control. BSNL at its sole discretion may revise the tariff rate subject to TRAI regulations. The services can be suspended without prior notice by BSNL in the interest of public safety or maintenance of law and order or other such exigencies. In terms of Section 5 (1) of the Right to Information Act, 2005, the Company has designated various officials as Information Officers (APIOs & PIOs) and Appellate authorities. The list of such officers is available at the Company’s Website www.bsnl.co.in. The concern designated APIOs, PIOs can be approached for getting the information as pursuant to the RTI Act 2005 at various places. L. Information about Customer Service centre.